The Obama administration is withholding from Congress and the American people detailed information about more than 86,000 illegal aliens who have committed serious crimes and continue to walk the streets in the United States, according to conversations with a member of Congress, who disclosed to the Washington Free Beacon that "if the public knew about this there would be total absolute outrage" over the matter. Rep. Brian Babin (R., Texas) told the Free Beacon that the administration is trying to suppress information about the release of some 86,000 criminal illegal immigrants who have committed 231,000 crimes in just the past two and a half years. Babin, who is spearheading new legislation to boost the deportation rate of these criminals, many of whom continue to walk free across America, warned that the administration is not taking action to deport these criminal illegal immigrants once they are freed from U.S. prisons. "All I can think of is they don’t want the general public to know what’s going on," Babin said in an interview. "When you have 86,000 criminal aliens committing 231,000 crimes just over the last two and half years, I don’t think they want the public to know what’s going on." "I think if the public knew about this there would be total absolute outrage," Babin said. "I talk to some of these victims families, it’s just incredible to see what has happened and the fact these people served time for felonies, they’re released from prison, they’re illegally here, and then not being deported, so they go back to their life of crime." Babin said that he has not "had any briefings by the administration" on the matter. "My briefings are coming from the victims’ families or the victims themselves of these people who are being released and are criminal aliens here," he said. "Some of these stories are absolutely tragic." Babin is the author of legislation that would halt travel visas and U.S. foreign aid to any country that refuses to take back its citizens. The bill comes as the Obama administration has deported a very small number of illegal immigrants from the United States. The Immigration and Customs Enforcement bureau deported nearly 410,000 aliens in 2012 when it received roughly $2.8 billion in taxpayer funds. The agency expelled just 235,413 aliens in 2015 but received around $3.5 billion to fund its deportation programs, according to the DHS statistics. Deportations have dropped by 174,436 over the past three years despite an increase in funding totaling more than $680 million, according to the statistics. Separate statistics issued by the Department of Homeland Security reveal that the administration deported less than 1 percent of foreigners who illegally overstayed their travel visas to the United States. Babin compared the situation to a similar controversy over the administration’s plan to bring in more than 10,000 Syrian refugees over the next year. Congressional critics of the plan have warned that federal authorities do not have the capability to properly vet these individuals for ties to terrorism. "It’s kind of like our refugee situation," Babin said. "It’s very, very difficult to get information about how these refugees are brought into our country and settled around into localities without the knowledge of the local citizens." When U.S. cities do finally learn about these refugees, "they have really no authority to stop it or even slow it down. All you can think of is that the administration really is not too wild about the American citizens finding out about how these things operate." 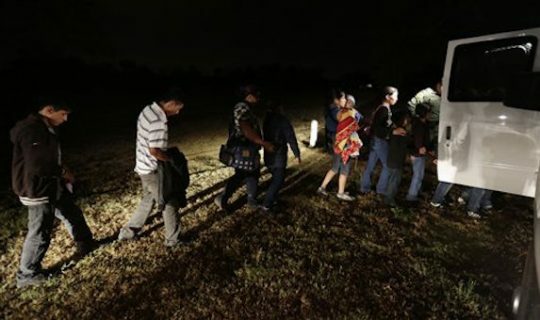 At least 179,029 criminal illegal aliens who have been ordered deported from the United States continue to roam free, according to the Senate Judiciary Committee. The Free Beacon disclosed in August 2015 that the administration had been keeping the release of violent illegal immigrants a secret from U.S. towns. Babin said that his legislation would help remedy the program by penalizing foreign nations for their continued refusal to take back their citizens. "This is a bipartisan bill," he said. "There’s nothing partisan about this. We’re trying to protect U.S. citizens." This entry was posted in National Security and tagged Illegal Immigration, Obama Administration. Bookmark the permalink.